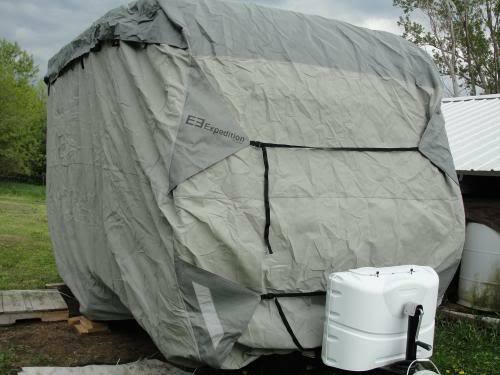 i have been having a bit of trouble finding a trailer cover for a smaller cover. anyone know of somewhere to get a cover that doesn't have 10' extra length? thanks and happy trailering everyone! We have had our T-139 for two years and I have simply folded and tucked the excess in the front and tied it down around the frame. 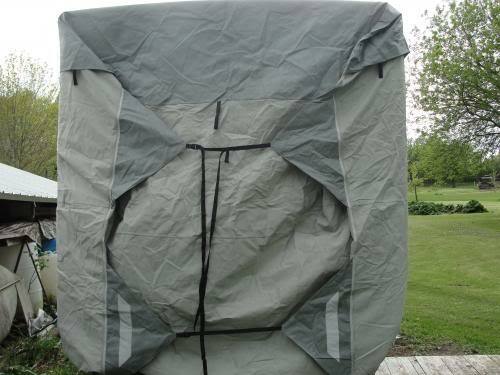 I purchased this cover from Camping World because it was the smallest in length (20') and cheaper than special ordering one to size. I regret my decision and will order one from CW made to fit. I think it will be worth the difference in cost. Know you're not alone! Did you ever find a cover that fit? I have an X139 and would like to cover it in the winter. I can't speak about the fit yet because I haven't put it on, to busy getting things ready,but it's not way to big like those 20 ft ones I saw. Paid 156.61 with the 5% discount + shipping. Well I got out today and put it on. I think it looks good, but this is my first cover on my first full size trailer,let me know what you guys think. 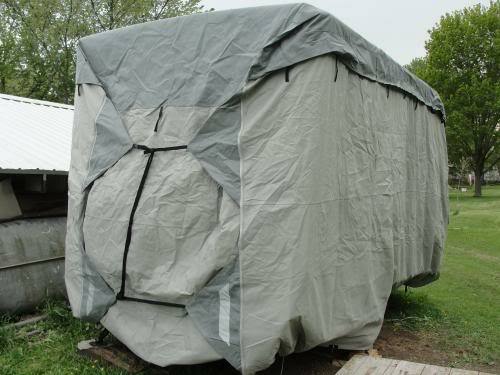 I was thinking about buying a 10 x 20 awning from costco for about $150. My X139 is 7' wide, as most are and the 20' awning is more than enough for it's length. Problem is height and need clearance for AC unit. I'm thinking of using cinder block and wood to raise the 8 legs of the awning. The awning should clear well as it has a peak. Then use rope and sandbags to hold it down. Seen it done on boats, etc. and seems to work well. All I have to do is back the trailer in. Hi Iggy, Jim and I have the same setup as you but our Chevy is a 2008. He keeps telling me we can not up grade to a 16 or 18 ft Fun Finder because of the auto trans. I told him I think we can. To be certain of what you can tow you need to look up your vehicles tow rating and find the GVWR (gross vehicle weight rating). The GVWR will give you the total weight you can safely tow including the weight of everything loaded in your vehicle, your trailer and what's in your trailer. I would think a 2008 Chevy 1500 could easily tow a 16 or 18 ft. But, depending on what engine you have, and what options you have such as 4 wheel drive or a tow package, it can make a big difference. I tow a 21 ft fun finder with a 1999 Tahoe with a tow package with no problem. I also use a weight distributing hitch which makes a big difference. check with Ted at Allseasons Rv, 231 739 5269, he can probably get you one.